The Telemark v2 builds on a solid heritage to deliver a great piece of truly analogue hardware. It sounds great. Extremely flexible. Plenty of connectivity. Just over four years ago we took a look at the first incarnation of Analogue Solutions' Telemark synth module. In the intervening time we've seen no abatement in the fascination, love and sales of analogue synths both new and old. In fact, despite the proliferation of virtual software variants, the price of original 'vintage' hardware has been rising steadily. Not only that, but there has been a rebirth in remakes and reinventions of some old classics including those from synth legends Tom Oberheim and Dave Smith (father of both MIDI and Sequential Circuits). And last year Arturia (who up until then had dedicated themselves to the creation of emulative software) introduced a standalone synth with a completely analogue signal path that sported CV/ Gate connectivity. It is in this landscape that we now find ourselves staring at the spacious cream livery of the Telemark v2. The most noticeable aspect of the v2 is that on first glance it is substantially similar to the original. In fact there is little to indicate that this is an updated version unless you really know what to look for. In this case it means the replacing of two 'MULTIPLE' patch points with 'SUB-OSC/DIVIDER' and 'RING MOD' sections. 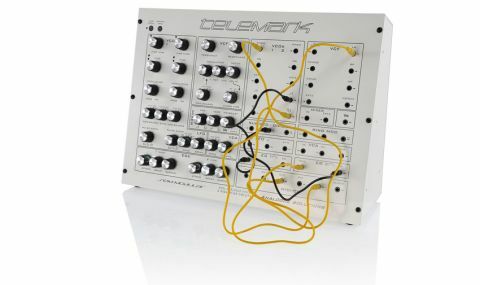 The Telemark was originally conceived as being a more feature-rich variation on Tom Oberheim's SEM (Synthesizer Expander Module) design from 1974. The Oberheim SEM achieved legendary status and went on to be the basis of some of the earliest polyphonic synth systems. Despite the similarities though, Analogue Solutions make very clear in the manual that it is "not intended to be and is not a clone of the SEM. If you want a true SEM sound, buy a SEM!". So you've been told. "It's not a vast feature set, but it is more than capable of some fantastic leads, basses and drum sounds"
In basic hard-routed terms Telemark v2 features two oscillators fed into a 12db/octave multimode filter (VCF) and amplifier (VCA). All these can then be controlled or modulated via two simple envelope generators, an LFO or MIDI. Each oscillator has independent tuning and modulation controls and can generate saw or square waveshapes (with sync) - there's also a white noise source. So not a vast feature set when compared to many virtual instrument monsters of today, but even in this configuration it is more than capable of some fantastic leads, basses and drum sounds. Where things get interesting is with the patch panel to the right. Here you can access pretty much all aspects of the synth in terms of control and routing. For example, you can derive all the generated LFO waveforms separately and simultaneously, and feed each to a different destination. The multimode filter also provides separate outputs for the low-pass, band-pass, high-pass and notch sections. Things get especially interesting in the v2 when you start to explore the new sub-oscillator/divider. By taking the sawtooth waveform from VCO1 and patching it into this section you get a sawtooth waveform an octave or two below (or both if you are feeling adventurous). The output here can then be routed back into the mixer section via another of the patching points. As all this section really does is divide the frequency of the input it can also be applied to the LFO. In fact half the fun of modular synthesis comes with the unexpected results of random patching. The v2 introduces a ring modulator section, which takes the synth into more clangorous territory. It's also worth remembering that the Telemark has rear panel input jacks for feeding external sources into the synth so that they can then be processed by all the available filtering and sound-processing sections or even used as modulators themselves. We have to admit that initially we did miss the two 'MULTIPLE' splitter/mixer sections on the v1, even though they can be replicated by a purchasing few splitter cables. However, the addition of the sub/divider and ring mod sections more than makes up for this. MIDI is well catered for with the Telemark v2, with the onboard MIDI to CV converter capable of controlling the pitch of the VCOs and filter cutoff (mapped to MIDI velocity) directly. The front panel also sports CV/Gate outputs allowing you to control other synths as well. There is also now a dedicated 'Clock' output derived from any incoming MIDI clock signal. We tested the Telemark under direct MIDI control and successfully hooked it up to an Arturia MiniBrute via the CV/Gate patch points. It was also pretty straightforward (and lots of fun) to get the MiniBrute's arpeggiator to drive the Telemark. The final addition to the v2 is Poly Mode, which allows you to chain two Telemarks to create a two-note polyphonic system. I'm reliably informed that a four-voice mode can added on request - now there's a system we could live with! The Telemark is a flexible, very capable and fine sounding synth, especially when hooked up to an analogue sequencer or used in conjunction with software such as MOTU's Volta or Expert Sleepers' Silent Way (which allow some audio interfaces to double as multi-output CV/Gate sources). However, at £899 it is certainly not cheap, though it is by no means overpriced. Despite our initial reservations about internal build-quality (which happened to be a loose screw), closer inspection revealed the high-quality innards. Spending a tenth of this will get you a pretty good software emulation of an Oberheim SEM, though it will most definitely lack the charm, sound, flexibility and physical presence of this very usable and individual hardware.